So instead of immediate past and how it originated, I asked how he felt and thought about me when we FIRST met. I tried this out because I thought it would be super easy to figure out because we had such a lovely time and he was very clearly interested in the beginning. There was no ambiguity. So when I asked how he felt about me at the beginning, I got 2 of pentacles and 4 of cups. And what he thought of me, I got death and 5 of swords reversed. This was shocking and left me confused because I was expecting something light and positive. Any thoughts on that? How would you interpret these two? Now this is interesting because I can see where you might feel shocked by such cards. It may be just one of those readings that is best discarded as you feel the cards are way off. Something about Death and The Five of Swords hits me. Was this person getting over a very bad time in his life? If so, he may see you as someone who has helped him move on or let go. He may not have shared this information with you but he might be seeing you as his chance to find happiness. Has he spoken to you of his past? If there something big there, he may not want to burden you with it. These are quite strong cards. They either mean something, or absolutely nothing. Your reading may be tainted, or one of those readings that makes no sense whatsoever. When asking the cards about how other people feel, they are not always obliging. You might need to rephrase your question. Don’t worry about that reading unless similar cards are turning up regularly. Some days are just off when drawing cards and the best advice is to step away from them when it happens. The thing is, all (or almost all) of the other cards in the rest of the spread made sense! So I was bewildered with these first two. Could the 2 of pentacles & 4 of cups mean he thought I was lighthearted/well-grounded and emotionally stable? He later on revealed that he thought I was challenging/hard to get (in a good way). So I guess it could also mean a challenge while keeping his emotions in check and not get carried away with someone who seems like a challenge/very busy in their own life. This was a very recent past romantic situation I was involved in and honestly, I don’t know his past, so it’s very likely that perhaps he had a difficult situation but didn’t tell me. I do know for a fact he had a girlfriend a couple of months before he met me, which was completely over. But maybe he is not over it or something. I also do know for a fact that he does have difficulty dealing with his emotions. We separated ways due to external circumstances (I was moving to another country) and a tarot reader had told me that he was controlling his emotions and dealt with things in a very pragmatic way. So he showed no vulnerability when I was leaving. This hurt me a great deal but I comforted myself acknowledging that I don’t truly know him beyond a couple of months together and the professional tarot reader’s reading was incredibly helpful/insightful for understanding things better. So, perhaps I will never know. But your explanation is also very helpful! I had an inclination that maybe it means some painful situation is over but I was confused because that doesn’t tell me how he felt about me specifically but more so his circumstances. Thank you for your interpretation and feedback. Sorry, I thought you were askig about Death and Reversed Five of Swords only. As for the potential interpretation I gave re those two cards, I feel his lack of emotion or vulnerability when you were leaving may be something he deliberately projected to block himself from feeling sad. With the Five of Swords Reversed he is dealing with the Death of the relationship in a very controlled manner. The Five of Swords Reversed could be showing a feigned or forced coolness. I feel there may be a story behind his attitude when you were leaving. He might be afraid to be emotional as a result of a previous experience. I suppose you will never know unless you ask. Did the relationship end completely after you moved or are you still in contact? You could subtlety bring it up in conversation. Perhaps he did not want to stand in your way, or hold you back so he appeared the way he did when you were leaving. 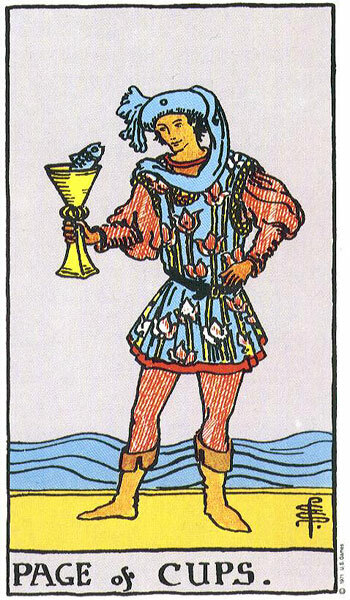 As for the Four of Cups and Two of Pentacles, he seems to have seen you as a person who had plans for her life, and were steadily working towards them. 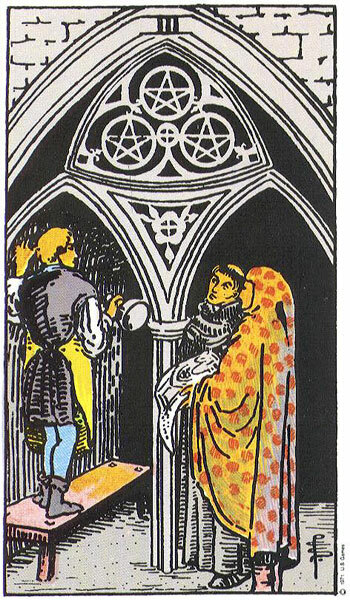 Yes, you can see the busyness of the Two of Pentacles. Perhaps he thought you so totally preoccupied with your goals that you would not have time for him. If you are the Two of Pentacles then he might be the Four of Cups who found it hard to get your attention as it was focused elsewhere. That is why he might have found you challenging, hard to get in a way. This of course may have only been his perception of you, and not based on fact at all. If so, he might see you on a complete different level to him. The Death and Reversed Five of Swords could show a fatalistic attitude he had about the relationship, as in he never thought it would last. Did he always know you would be going away? Would he be in some way angry about that and perhaps showed no vulnerablity as a way of getting you back for leaving? We all deal with separation differently. I do hope you are settling into your new home and environment. Well, we weren’t in an official relationship because he knew I was leaving. HOWEVER, we only knew that I had to leave about a month after we first started seeing each other. So these initial cards were drawn with the intention of gauging how he felt before. Because I had later on asked how did him finding out I had to leave affect the way he saw me and it was the king of swords reversed — which ties in well with your interpretations (emotionally unavailable from that point onward although it didn’t seem like it on the surface). We’re in touch in a very casual way but as far as a ‘relationship’ goes, that has ended sadly because he really does not seem to want to open up emotionally, although he is a very nice person. You’re absolutely right that we all deal with separation differently — which is why I couldn’t understand for the life of me how he could behave the way he did after being so warm and caring 🙂 He follows his head and I follow my heart so even if I understand this on an intellectual level, I still felt so baffled. 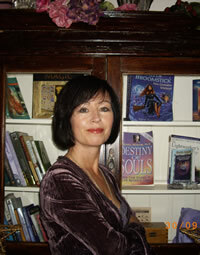 The tarot has really helped immensely to gain more clarity and helped me grow as a result. And your added perspective helps a lot too. P.S. Forgot to mention I also got the 3 of swords reversed when asked what I need to know about his detached response when I poured out my honest feelings. So I interpreted that as controlling his emotions and not wanting to speak about this further. 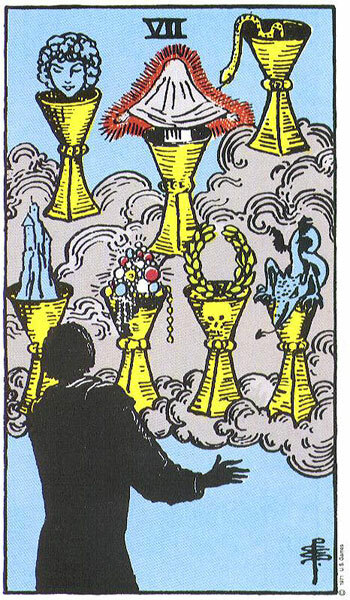 And how he felt — tower reversed and 3 of cups which I interpreted as again, not wanting to confront something and avoiding/escaping it by socialising with his friends. 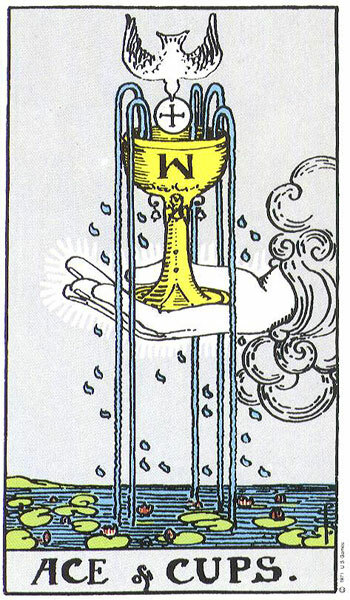 Seven of Cups as Significator. If you drew this deliberately yourself it suggests you are aware of the temptation that surrounds you. You were in the lucky situation of having two love interests to choose from. Perhaps you felt there were no external threats to this situation, that you could date the one you had the least emotional connection with, thus saving you from actually falling in love and not having to commit to a full-time relationship. However, there was also the other who unsettled you emotionally. It was safe as there were just the three of you thus giving you the freedom to date one while keeping the other as a single friend/love interest. Happy days! The Four of Cups shows the first relationship not working out. You hadn’t intended it to work out long-term as you did not have very strong feelings for him and intended leaving after a month, or that he was due to leave after a month. Regardless of your intentions to not get involved and just be happy dating the guy the Four of Cups shows you feeling bored and disinterested in the relationship. It was doing nothing for you but note how focused you are on the three cups in front of you, not the one that is being offered. The partner you chose seems to be still interested in you, still wants to engage with you but your focus lies elsewhere as you do not feel emotionally connected to him. 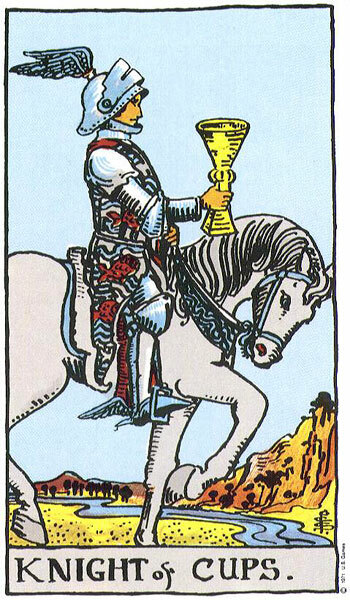 The choice you made in the Seven of Cups may not have been advisable after all and has possibly back-fired on you. 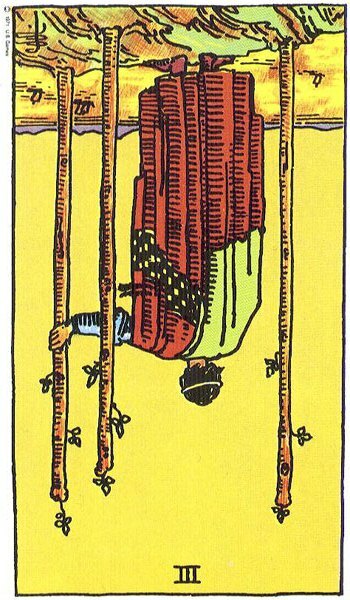 While you were sleep-walking through a relationship that was emotionally unfulfilling, the guy you did have feelings for but chose to resist, has stood by patiently waiting in the Nine of Wands. However, he does not look happy. He has to stand and watch you date his best friend, knowing that he has feelings for you but not wanting to be disloyal to his friend. 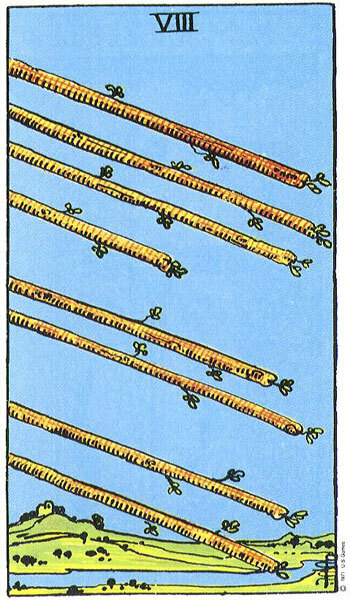 The Nine of Wands could also point to his hanging in there for his ex to return. If you had been free, he may have made a move, but your involvement with his friend may have ruled this out for him. In the meantime this has left a void where he perhaps got lonely, felt left out and possibly fed up standing on his own while his friend was otherwise occupied. This left the door wide open for rekindling of a previous relationship. Now there is a chance this would have happened one way or another, but there is also the possibility if you had gone with your true feelings and chosen him, the ex may never have had a chance to resurface as he would have been happy with you. 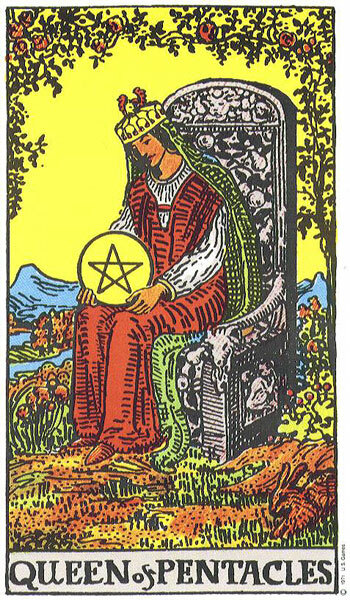 As the Queen of Pentacles you were approaching the whole thing on a very practical level. You didn’t want to upset his friend and decided to wait until he left before declaring your feelings for him. 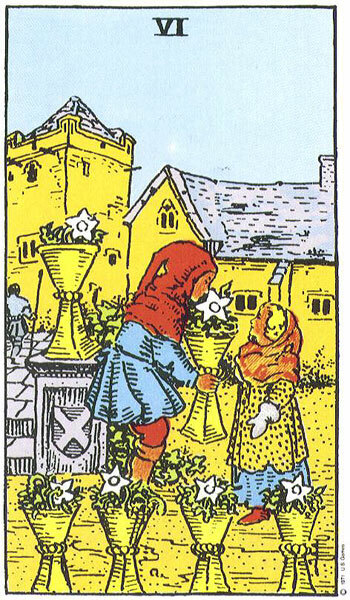 Now perhaps if you hadn’t been so obliging and considerate you may have got in before his ex did, but I do believe that part of his confusion as shown in his Four of Cups lies with you dating his friend while having feelings for him. Maybe it is too much for him to deal with. What would his friend say if he found out? How does he feel about you doing this to his friend? The Seven of Swords and Eight of Wands could hint at entering some form of relationship while he conducts a long-term relationship with his ex who is now back in his life again, albeit at a considerable distance. It may be a case of while the cat is away, the mice will play. There is temptation here and a risk of being deceitful or underhand. I think you need to be careful of becoming involved romantically or sexually with this guy while there is a girlfriend on the scene as you may lose both this friend and his friend. His friend, your ex may be awkward if he finds out about the two of you. He may believe something was going on between the two of you while you were dating him. You could stand to lose both, but it depends how much this would bother you. There may be a sense that with the girlfriend far away, it leaves you the time and space to win him over. I feel something may happen in the short term between the two of you. There may be a hot romance, a fling which is made more exciting by the fact it has to be carried out secretly, from his friend and long distant girlfriend. I feel it is inevitable, especially with her not being around. However, your outcome card is the Reversed Eight of Swords which could find you painting yourself into a corner and getting caught in a no win situation. The Reversed Eight of Swords ultimately leads back to the Upright Seven of Swords where secrecy, deceit and clandestine meetings occur. You may decide to run with this and take your chances but I do not feel it will serve your purposes. Staying disciplined and waiting, as he did in your case, to see how the relationship will pan out with the girlfriend is the best way to go. He knows how you feel about him, you told him of your feelings. Now you must let him do what he thinks is right for him (Judgement) as you did for yourself not too long ago. Often resuming a relationship with an ex is doomed from the start. At first there is comfort in familiarity but whatever problems that caused the break up are likely still there, unless it was decided to take a break for non relationship issues such as relocating for work or fulfilling a dream to travel the world for example. It won’t take long to see which way this relationship will go and if he decides to end it on the basis of having a chance with you, then you can happily step forward in an open and honest manner. The ball is in his court not yours and you must be patient. From his side I got 1) 9 of wands 2) 4 of cups 3) 9 of swords 4) judgement and 5) ten of cups (significator: chariot reversed). He has two Nines and a Ten in his reading suggesting the final outcome of a situation prior to the beginning of a new one. 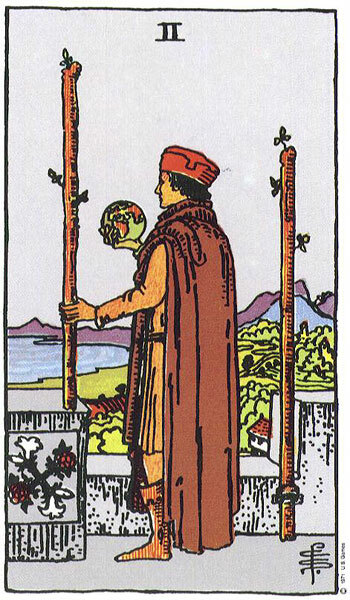 The Nine of Wands does show him giving much thought to his situation as he reflects on all that has gone before. He acknowledges he has made mistakes and wants to learn from them. This has not been an easy time for him but with regards to his feelings for his ex, I don’t see him as a quitter and he may have been hanging in for some time hoping she would return. 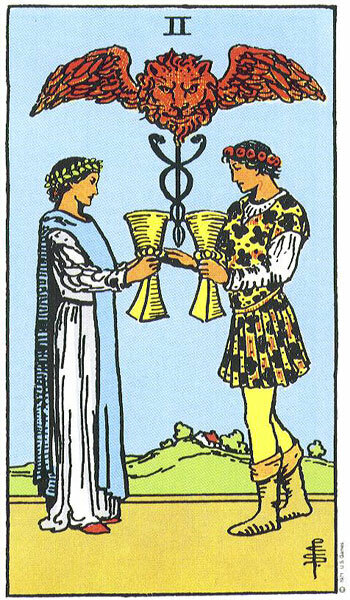 I think with the Four of Cups he had reached a stage of disillusionment, felt he was holding out for nothing and may have entertained a romance with you. The 9 of Swords finds him distressed and wondering what to do. Should he re-connect with his ex who he knows so well and misses, or does he start a relationship with you? If he turns down his ex, that is the end of it all. It is over, and especially when she finds out about another woman. He has to be sure he makes the right choice. With Judgement I feel this guy is very deep and conscientious about the decision making process. He knows that his decision will have far reaching consequences for him. I feel he will choose his ex, at least in the immediate sense as he has to give it one last go to see if it will work out between them. There is a strong connection between them. I see the Ten of Cups reflecting this and there may be an engagement. This may all lead nowhere but if they reconnect it will be to make something more formal. 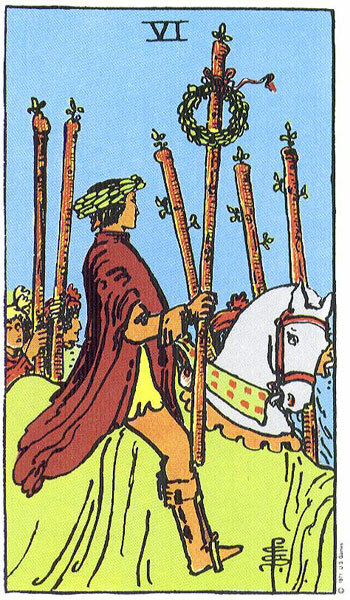 The Eight of Wands from your own reading could connect with this reading if we see him fly out to join her, meet her or vice versa. 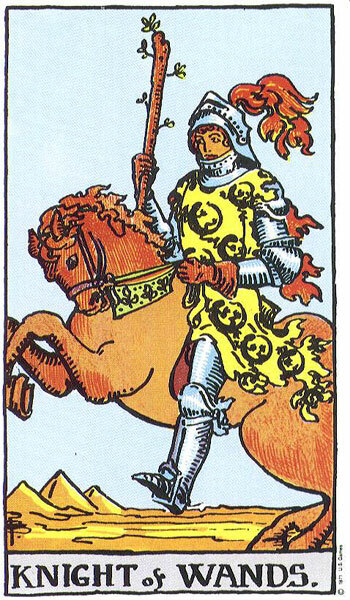 His Significator is the Chariot Reversed. I feel after the break up of his relationship, and I wonder who ended it, he saw himself as back in the saddle again, eager to join life again and be free to come and go as he pleased, in charge of himself and in total control. However, he may have imagined it to be more exciting than it turned out to be. I think he is a bit disillusioned with the single life and at present is quite happy to reign himself in, unhitch the horses and return back to card 6 which is the Lovers Upright, his ex. Now this is all pure speculation but you did ask for my input. If you do not want to lose him as a friend, you must stand back and let him do what he wants without trying to influence his decisions making processes. 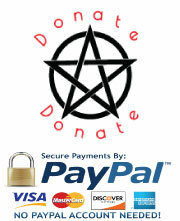 This might involve physically withdrawing so he is not distracted or exposed to temptation while he works it all out. He knows how you feel about him so don’t worry about that. You might have to let this one go and learn a lesson from it. You thought you had it all under control, your heart protected, in charge of your future and then your very actions facilitated the one you truly were interested in having the time and space to rekindle an old romance. 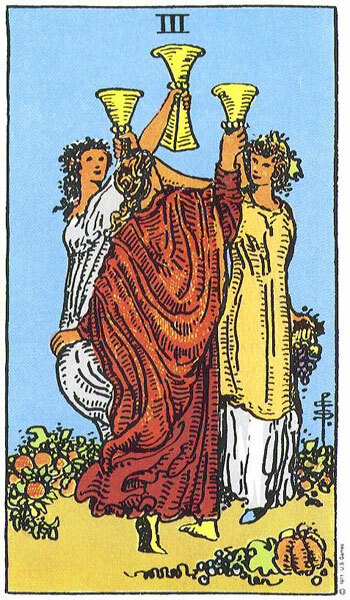 If you had followed your heart instead of your head, ignored the influence of the Practical Queen of Pentacles in this instance, you might be happily immersed in a loving relationship. But then again, this guy may always have gone back to his ex once the opportunity presented. If you value his friendship then it is a case of wait and see. I hope I have given you a bit more insight into your cards but remember this is just my input and not an actual reading as I do no longer do distant reading.